Prince D'Angkor Hotel & Spa is a sanctuary for tourist and corporate guests who expect excellent hospitality and friendly service. So whether you are on business or pleasure, the Prince D'Angkor Hotel & Spa is a luxurious haven, elegantly furnished to provide you with a comfortable stay and for you to enjoy all the facilities and traditional Cambodian hospitality of Prince D´Angkor Hotel & Spa. And yet it is located in the heart of the city where you can walk to anywhere in a minute. Uncompromising dining excellence. The finest taste from around the world brought to you in an elegant, modern setting. Indulge in an extensive variety of international menu selections and buffets from Eastern & Western cuisine at our Blue Diamond Restaurant. Experience a truly sumptuous feast at the Emerald Restaurant & Terrace. Take your pick from a mouthwatering selection of beautifully designed dishes. This unique restaurant offers you outstanding cuisine and service. Prince D´Angkor Hotel & Spa offers an idyllic setting, combined with state-of-the-art facilities and the distinctive service perfect for meetings, conferences and special events. With a capacity of up to 250 people, our fully equipped ToPaz Conference Room together with our well trained professional staff are the key to successful meetings, conferences, seminars, banquets, private functions and briefings with modern meeting facilities. Success is in your agenda. A sanctuary from the outside world, Prince D´Angkor Hotel & Spa with separate ladies and gentlemen Sauna and Steam Room, indoor and outdoor Jacuzzi is a place to refresh all the senses. For total relaxation, pamper yourself in the hands of our highly trained therapists. A wide range of personalized treatments blend the international expertise of our Opal Spa with traditional Khmer and Thai healing arts to cleanse, moisturize and rejuvenate. Our Fitness club features superior Gym equipments. This is truly a place to refresh all the senses. The Biggest Saltwater Outdoor-Swimming Pool with separate Children's Pool and Jacuzzi within tropical landscaped gardens can be a great stimulus for the appetite and many guests take advantage of the service provided by the Pool-Side Bar where a range of drinks, fresh fruits, juices and tasty snacks can be enjoyed during the pool service hours. Prince Royal & Presidential Suites - Located in the main building, each suite comprises a spacious living room and a master bedroom which is splendidly furnished with a luxurious blend of Cambodian art deco themes and Sony 32" LCD TV with personal DVD player. There are assorted Cambodian handicrafts, artifacts and artwork as well as a luxurious bath within each suite. It offers uninterrupted views of the panoramic swimming pool and our tropical landscaped gardens. Champei rooms - These rooms are located in the Wooden House and have a private terrace or balcony. 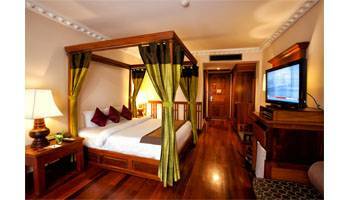 They are nicely furnished with a luxurious blend of Cambodian art deco themes, and come with Sony 32" LCD TV with personal DVD player. 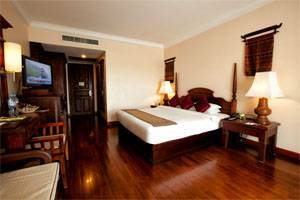 The Champei Rooms have king size beds as well as a view of the swimming pool and our tropical landscaped gardens. Deluxe Rooms - Located in the main building, we offer double, twin or triple rooms. Each room comes with a balcony, Sony 32" LCD TV with personal DVD player and a sensational view of the swimming pool and our tropical landscaped gardens. 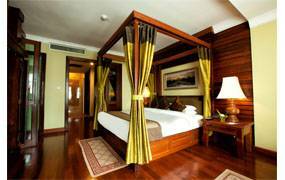 Superior Rooms - Located in the front building, each room is well decorated in the local wooden furniture style and offers a panoramic view. You can choose from double, twin or triple bed. A Khmer & Western Food Restaurant with Apsara Dance Show. It is just 2 minutes walk. A Khmer & Western Food Restaurant. It is just 10 minutes walk. - Need Credit Card No. to guarantee the booking. - Always pay by Cash or Credit Card up on departure. - Cancellation Policy : Reservation may be cancelled up to 14 days prior to the group arrival or 7 days prior to the FIT arrival without penalty. Cancellation received after the relevant cut-off time will result in a charge amounting to one days room rate for each room cancelled. - No Show Policy : No show on the day of arrival will be charged an amount equal to one nights room rate. - Child Policy : Free for 1 children under the aged of 12 years old sharing existing bedding with parents. Extra Bed is available at 30 nett per room per night. 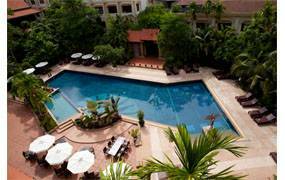 Conveniently located in the HEART OF SIEM REAP historical, cultural, shopping and business district. 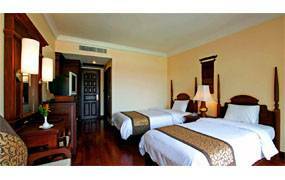 The hotel is only a 15 minutes drive from Siem Reap International Airport and just 10 minutes from Angkor Wat. The City Centre Hotel & Spa in the Home of Angkor. Nearest airport: Only 15 minutes drive from the Siem Reap International Airport.